Will it be a total new website with layout etc??? Bjornos80 wrote: Will it be a total new website with layout etc??? Competitions is now listed under each Tour and it's called "Active Tournaments". Btw, for those have been activated, you can now play Combine and OGT Practice. Please try them out. From in game main menu, Tournaments, then Private. I like the new website, it looks very clean !! Made my donation @ 4:05 AM and was activated by 10:02 AM. Thanks Z! (Went to Doctors App. at 9 and 9:30 AM, Had breakfast, Went to bank. Logged into new OGT Account) Time for a nap. I've just added CTP at Georgia Pines(2 rounds) and Long Drive at Dalhousie. Members were auto registered for these two events. You can play them from Tournaments/Private. Good news! You do an excellent job with this tour and with this site. I am happy to contribute and appreciate all the effort that goes into making this an enjoyable experience. Keep up the great work! Did you use user name and password from activation email you received after donating? Mine didnt work either but i had 1 uppercase letter wrong at first. Please login and reset it. I just learned from a friend of the new plans for OGT and PC players. I won't be joining, and honestly haven't played tournaments at OGT for several months. That said, I wanted to thank you and your support staff for the many hours of enjoyment that OGT provided to the JNPG community. 32 members and counting. Thanks guys. First tournament starts March 9th at Copperhead. But thanks for running this and all the hard work you guys have done. 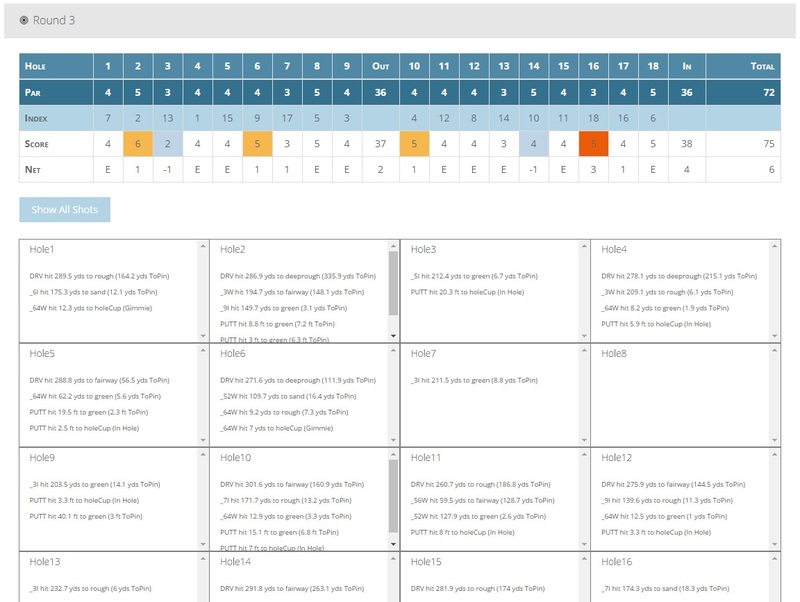 OGT Shot Tracker is now available on new PGA tour and simulator tour. Go to any OGT scorecard, select the round, then click on Show Shots. Note: If this feature starts to slow the site down in anyway, we'll have to remove it. Zmax wrote: OGT Shot Tracker is now available on new PGA tour and simulator tour. Go to any OGT scorecard, select the round, then click on Show Shots. Wow! This is a great feature!! Even if it slows the site a bit down, i think that this could lure a lot of players in. Please spread the news (All players should know - at the PP forums as well)! I would love to see a new stat: Total length of putts made. I find this a really helpful stat. Just an idea. Yes a lot more stats are possible with this and I'm sure I'll think of a way to process them offline.